15 Manor Court is a modern ground floor apartment, situated just 15 minutes walk from the city centre with easy access to York University. The flat is so comfortably furnished and has a very well equipped kitchen and an ensuite wet room in addition to the msain bathroom. The flat is very spacious, my partner’s wheelvhair is easilly accommodated. There is also plent of room for my guide dog!!! The beds are generally comfortable and Manor Court is quiet at night. We have alreadty booked for stay for next year!!! Both my partnrer and I would highly recommend this accommodation..
We stayed as a family of 6 in the flat for 4 days. Accessibility was very important for us and the flat was perfect for this: it is located on the ground floor with no stairs and has a parking place. Buses to go into town are frequent and reliable. 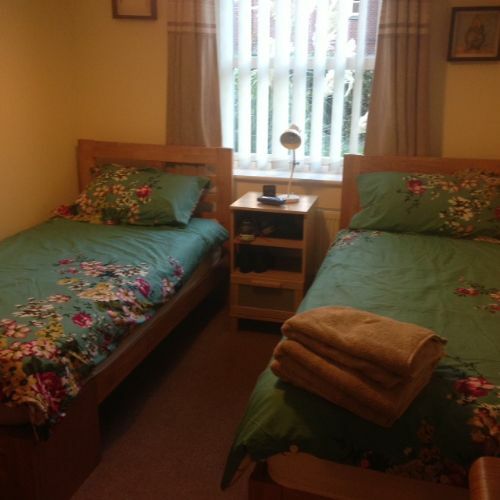 The two bedrooms are comfortable and bedding is in very good condition. It is very quiet. Our daughters slept on extra beds that were comfortable enough. 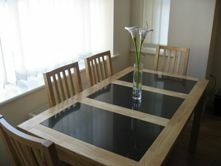 The only problem was that we had only 4 chairs to sit at the table for 6 so it was a bit difficult. In summary, the flat is perfect for 4 persons, but it is more difficult to stay accomodate 6 persons. Two extra chairs and more plates are needed. 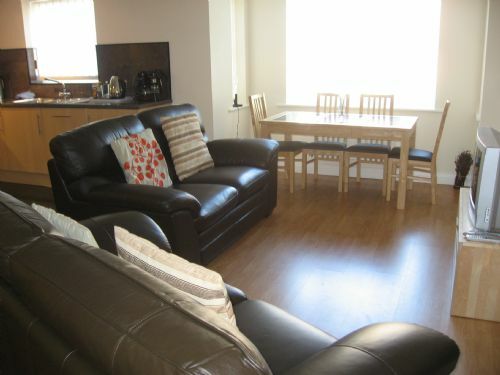 Lovely Flat, perfect for families. 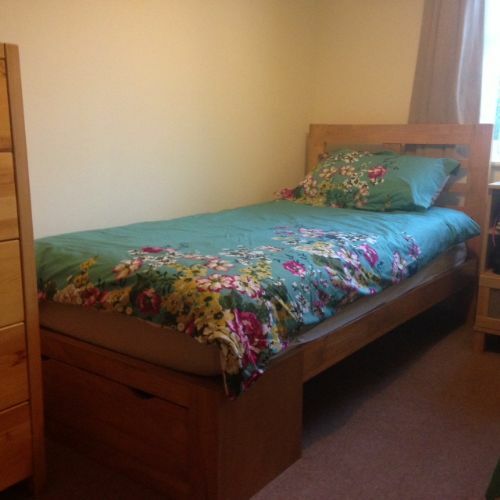 Really lovely flat with convenient amenities nearby. Perfect for me because I had a baby and a 2 year old and the wood floors and leather sofas were easy to keep clean! In York Holidays were super helpful and responsive, really excellent customer care! 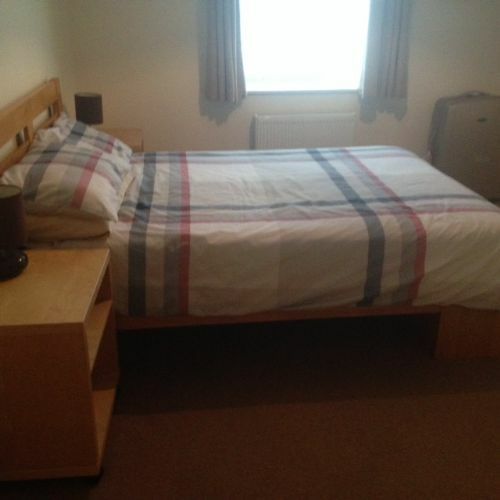 Ideal for a family home from home holiday in York. A little pricey , so could not recommend for regular holidays in our lovely City . 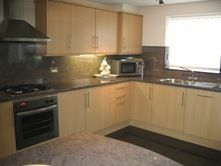 Lovely, clean & comfortable apartment, location not far outside the city walls so very convenient. Now the coffee table has been added all it's missing is hooks in the bathroom. Very nice place, have stayed before, will stay again. The property was just what I and my friends wanted. It was on the ground floor and they had an en-suite wet room which made life much easier for them as they both have mobility problems. 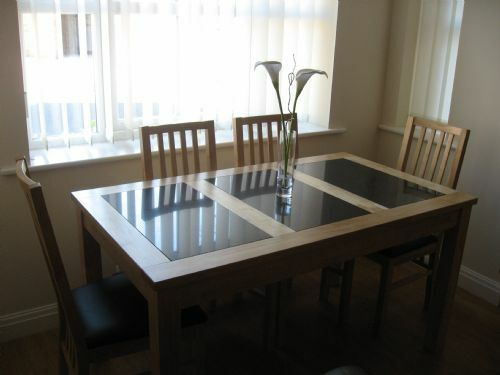 The property was clean, well furnished, very close to the centre of York and with its own parking place. The local mini M & S was great for picking up milk, bread etc. My one criticism would be the poor venting of the en-suite shower and the bathroom. The condensation was so bad that towels became damp whilst having a shower and even leaving the fan on it took ages for the condensation to disappear. I don't know what can be done about that. As the weather was warm we did not need to turn the heating on so the towel racks stayed cold. I would certainly recommend this property to my friends and would book it again if I was going to York for another holiday. Very excellent place. I will advise my friends and family to go there. The service was excellent and the place is very quiet. The gorgeous and clean furniture. A long term visit to York at 80 years of age. At 80years of age the appartment was at the wrong side of York for me. The lack of frequent buses meant that I had to wait in the cold for long periods of time.the main number 10 bus did not even go as far as the Railway Station. The appartment it self was spacious and the dish washer was excellent. The beds even after being replaced left much to be desired. ( King Size Singles are now the norm ) To have a heat sensative alarm above the cooking stove was very inconvenient when cooking. The introduction of the safety bar in the En Suite Shower was appreciated, but the extractor vent needs to be greatly improved. The correct advertising for this appartment is for four persons not six. I would like to thank the House Keeper who was excellent, obliging, thoughtful and helpful. Also the the Plumber, the same. We have a lovely stay in York and at 15 Manor Court. We are a five person family from France. The welcome by Christine was very pleasant. 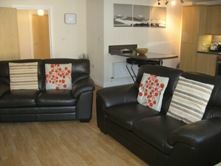 The apartment provide all you need for a short or a middle stay. The thing it could improve are the bedding. We think beds are too soft. But, perhaps this is usual in England. Also, the cost is a little expensive compared than same rented apartment in France. We had not been to York before as a family or as a wheelchair user. The accommodation was excellent for my chair as access was very easy. The stools were a bit high for me, but the shower was great and there was a shower chair to use. Although traffic made us late. We were able to get in without any problems. A lovely stay York is great. The property is spacious and in very good condition. Kitchen has every sort of utensil and it's perfect if you want to stay for a week or more and want to cook instead of buying ready meals. 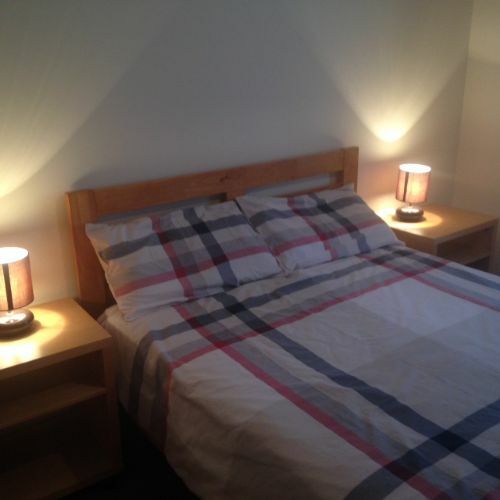 it's near the city centre and has almost everything you might need. The property is a good size, clean, comfortable and well equipped. Compared to the hotel prices in York, it was a bargain. Christine was an absolute star. Checking in/out is extremely easy. Location wise, it's a bit of a walk to town. We knew this and love the Lawrence Street area, so it was fine by us. Besides, in York you can get a taxi back from town for well under £10. Also, I've stayed in very central apartments in York and, although a shorter walk home after a dinner out, they're very noisy, and harder to park. Came here with my husband and my mum. Apartment was lovely and only 15 minute walk to city. There was everything in apartment that we needed and it was lovely and clean and comfortable. Would definitely recommend 15 manor court. Very nice appartment, only a short walk to the city walls. Very clean and comfortable and the appartment block wasn't noisy. No issues with our stay and we'll happily stay there again. The apartment itself is very comfortable,clean and spacious. The downside is the parking. There is only one allocated bay per apartment. If there are six guests it is unlikely they will all arrive in one car. We were given a permit and parked in the allocated bay but were still given a parking ticket at 10.30 at night. I think guests need to be warned about over zelous traffic wardens!! The smoke detectors are over sensitive and will go off if you open the oven door!! The beds are comfy and overall the apartment is really nice. Great location, and we missed the floods!!!!! 15 Manor Court is a great location, easy access to the town and university. The apartment is nice as spacious with two good size bedrooms. Thanks for the Christmas tree, one suggestion, please can you put some coat hocks up in the hallway. A lovely apartment in a great location. Very quiet, apart from someone repeatedly ringing the entry button at 4am! 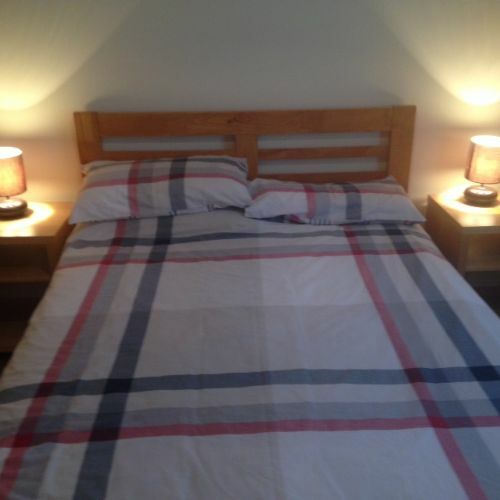 The apartment is well equipped and the single beds are very comfortable. Unfortunately the double bed isn't. We would definitely stay again. We enjoyed our stay at 15 Manor Court. The flat was clean and comfortable. The staff were very helpful when we had to add days onto our stay. Overall we were very satisfied. this apartment suited our purpose very well, as my daughters are wheelchair users and the apartment was well designed to accommodate us. also the location close to town without having the use public transport is ideal. There is a lack of proper mirrors in the property. The bed in the master bedroom could be more comfortable and there could be more instructions regarding how to use utilities like heating, washing machine etc. Small things but they make a difference. The accommodation was clean Comfortable and near a halal supermarket it's only 30 minutes walking from the city centre. This accommodation was just perfect for our requirements. My Mother hardly walks and uses a small mobility scooter, and she found the apartment easily accessible. The apartment was beautifully kept, clean and modern, and everything we needed for our stay was provided. The centre of York is only a twenty minute walk away so no worries about having to drive there and problems with parking. The apartment has an allocated parking bay and there are no steps outside. Thank you to Inyork Holidays, we would love to return one day. This property was modern, clean and comfortable and would have been perfect but for the lack of basics such as hand soap in the toilets and a hair dryer (if there was one we never found it). We've stayed in a number of self catering apartments and whilst we expect to provide our own food and personal toiletries we've never had to buy our own hand soap for the toilet. It might just have been an oversight. Another oversight was the filthy state of the coffee maker that still contained old coffee grounds with mould growing on it. Finally, every time you made toast the smoke alarm went off and the toast wasn't even burning it was just a very sensitive smoke alarm. All that being said the apartment was in a good central location and we were able to walk to all the places of interest even with a four year old. It is an ideal apartment for small children as there are no major safety issues and both our kids loved it. The travel cot that was provided for our youngest child was ideal and there was even a listening device. This review might sound a bit harsh but we were asked to be honest and we still really enjoyed our stay. The apartment was in need of a coat of paint in places but was clean. 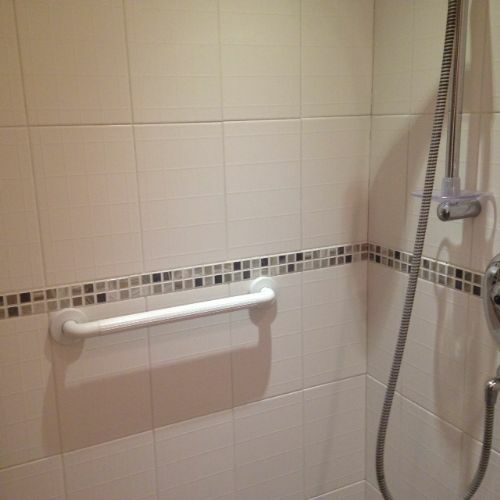 We were surprised that the apartment was advertised as suitable for wheelchair users, the bathroom had a wet room and a seat was available but the toilet was low and there were no handles. It was not easy to get the wheelchair to the bathroom as it was on an angle and area was not wide. We used the 2nd bathroom when not showering as it was straight access but again low toilet and no handles. The path to the centre were not in good condition and we learnt very quickly that cyclists thought they did not have to stop at crossings and on 3 occations in 2 days we were told to move while crossing a road!! We have an enjoyable stay in this place. 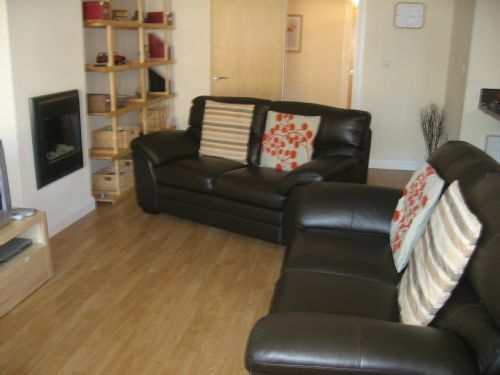 Accessible to most amenities and city centre is walking distance. The housekeeper is very accommodating to our needs. We stayed in Manor Court with our son, his wife and two children. It was large enough for all of us (6 in total) and very comfortable. The location is excellent as you can walk into the city centre and yet drive out of York easily if you want to sightsee in Yorkshire. There is a good quality supermarket within walking distance of the flat which is very useful. We would certainly consider staying there again. Booking with In York holidays was easy and the 'meet and greet' protocol was well organised. All my queries regarding the flat, were answered in a friendly manner.